When designing a WordPress site, many people overlook the power of the sidebar. It’s an excellent way to display information, and an even better way to display page-relevant information that doesn’t really fit into the “content” area of that page. Better yet, using dynamic content for the sidebar will make sure the user pays attention to it, since it (generally) displays less cluttered information and is obviously relevant to the page the user is currently browsing. Examples would be posts in the same category, author information, or specific ads for specific categories. What I will cover here today are various methods of displaying dynamic content for your sidebar. I know a few myself, but I also went ahead and looked for various other methods. Since WordPress 2.5, more functionality has been added to the get_sidebar command which allows us to include any sidebar we want with a file name format of sidebar-anything.php, instead of sidebar.php. The way we would go about this, is creating various files, such as: sidebar-about.php, sidebar-archives.php, etc. Then, in the index.php file, and all other pages which contain the get_sidebar(); command, we will replace that command and add a conditional statment. // We're on a "page", which? // Ah, the about page! This allows you to have an immense amount of sidebars, all different depending on which page of the site you decide to browse. The above code-snippet is courtesy of Chris Cagle. Simply including these sidebars is fine if you don’t use any widgets. Actually, it’s fine if you want the same widgets to display on each and every sidebar too, but if you want the widgets to change as well, you will have to mess a little with functions.php. What we want it to do is register more than one “sidebar”. Sidebar is actually not a very good term for it, I’d rather have it called widget_area or something like that, but that’s not important. Let’s just think of them as sidebars within sidebars. They contain your widgets. We’ll change the code in functions.php to the following instead, registering an additional sidebar. You can just copy/paste and add as many as you like, of course. This code snippet can be added anywhere, if you want that widget in your header, that’s just fine. Just include that little code snippet, and don’t forget to add just before your “sidebar” ends, avoiding PHP errors. <?php wp_list_bookmarks(); ?> // display your blogroll. NOTE: To make your widgets display properly, You might have to change a thing or two in the functions.php file as far as markup goes, then style it within your style.css, and perhaps take a look at the second link just below if you want something more advanced. Maybe you don’t want to include different sidebars for different pages/categories, but stick to one big one. On many sites, your sidebar might extend further than your content area, on short posts, or pages. This is fairly dysfunctional, and not very pretty. This might apply even if you use several sidebars, such as one for all category pages, and some categories are just not the content heavy, creating a hanging sidebar. Ryan at Dao By Design came up with a very clever solution for this. The idea is that depending on the amount of characters created by the loop, you display different amounts of content. This number will of course differ from site to site, so you’ll have to experiment. You’ll want the most important content to display at all times, and less important stuff, in Ryans case the blogroll, to display only if there is room for it. This is because the wp command doesn’t carry over variables passed in other parts of the template. For other areas, just change the “if $contlen > 3000” to something else. For the, in this example, badges, it would be “if $contlen > 1000” insert code for badges. Or for blogroll “if $contlen > 5000” insert code for blogroll. So, say I have a set of good posts that i have set up as “bestof”, and at the end of those, I want to link to other popular posts. For this we’ll use a widget called WordPress Popular Posts. We’ll add that widget to the “sidebar” we have registered as sidebar-bestof (we could include links to other posts in best-of category, but then we would use this cool widget). if ( !function_exists('dynamic_sidebar') || !dynamic_sidebar('sidebar-bestof') ) : ? // Add other posts / text / info if not in best-of category. That’s it for now. There is another method, creating custom sidebars through custom fields. That is a little more advanced, however, and we’ll save that for another tutorial. It is however, excellent when you want to have have more extensive sidebar content control through the admin interface, rather than editing the code. If you are designing premium themes, it would be a feature to implement next time, as it’s excellent for clients not able to touch the code. Thanks for reading folks, this is my first tutorial for WPCandy, please let me know if you enjoyed it, and what could be improved upon until next time, in the comments section. Until then, take care! The only problem with WordPress now is that you can only add a certain sidebar widget once, which could be a problem when you have multiple sidebars. Hopefully this will be resolved when WordPress 2.8 comes out. @zy – that is no longer a problem in WordPress 2.8 with the introduction of the multi-widget class. Of course, old widgets will need to include the new code for them to be used multiple times. Overall, great article. I don’t like this method of using all sorts of different sidebars for different page templates. Instead, I’d rather have a sidebar, but assign when and where widgets would be displayed. I tend to agree with Jeffro here. 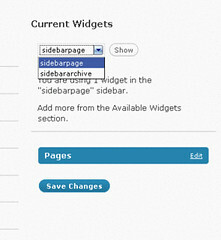 A single sidebar with the ability to assign which widgets show on specific pages is cleaner. There are several plugins that handle this (Widget Logic, Widget Context). I used to use the method described here, but it eventually became unruly. @zy – Multi-widgets have been possible for a long time (i.e., text widget, RSS widget). Just many of the default widgets could only be used once. If no one minds a little self-promotion around here, I’d like to point out the Widgets Reloaded plugin, which does just what you want with the default widgets. Justin: Yes, using widgets in that sense would work just fine 🙂 Personally, I prefer to use just one sidebar, with a bunch of custom fields, plus some regular wp expressions within conditional tags. There seems to be a syntax error though?? // We’re on a “page”, which? I am using a theme with 3 sidebars. A top sidebar and two sidebars below the top one. I would like to use a different top sidebar for each category so I can have different videos and other information specific to that category. I’m missing something. Which WordPress file do I add this code to and where in the page do I insert the code? Fantastic! There are a lot of help pages out there for people who do not have a functions.php in their default WordPress skin. Yours is the first I have found with a proper hack for those of us who do. Thank you! Is it possible to assign a sidebar to more than one page at a time? The above example doesn’t work, but is there a way to do it that would work? Thank you for this great post, I’m trying to use it on my site. In the second code set, you forgot an “;” after get_sidebar(). But anyway, very useful code!